Notes: "Cooks Welt Billet Verkauf, Bureaux des billets de M. Cooke." This building stands on the west side of Belmont Avenue, north of the east end of Machinery Hall. The pavilion is in the Renaissance style, handsomely ornamented and attractive in appearance. The ground plan is in the figure of a Greek cross. In the interior is a central hall 60 feet in diameter, offices, waiting-rooms and other apartments for the accommodation of visitors. This office belongs to Messrs. Cook, Son & Jenkins, the American branch of the house of Thomas Cook & Son, London, known all the world over as managers of excursions, tours and travels to all parts of the globe. By their extensive agencies and arrangements they ensure to the traveler the best accommodation on his journey, good hotels wherever he stops, and every comfort and convenience. 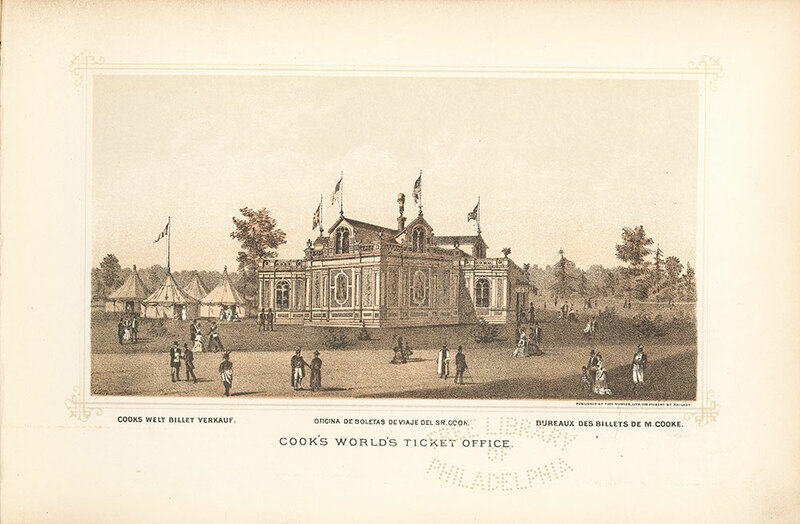 Cook’s Tourists’ tickets carry the holders to every portion of the civilized world. The whole business is under the control and charge of Mr. Thomas Cook, the senior member of the firm, who for almost a lifetime has been engaged in the business of teaching the people of the world how to travel cheaply, pleasantly and comfortably. These tourist tickets present also the additional advantage that they are not limited in time; they permit the tourist to stop en route at pleasure, while all unused tickets are redeemed. Hotel coupons are also issued, available for accommodation at at least one first-class hotel in every chief city of the world, at fixed and uniform prices, and that price lower than the regular price of the hotel. The firm holding this concession have had a similar connection with all the great expositions of the world, commencing in London in 1851, and ending in Vienna in 1873. Notes: The Building, situated in a grassy field. Tents and trees are inthe background. People stroll in the foreground.